Franco Andreone | My personal website etc. Madagascar, we know already, is a land with a huge amount of biodiversity. Part of this has been extinct since quite a long time ago. We talk about giant lemurs and giand birds. All these animals are said were extinct directly by the hands of man. This is the case of the giant wingless birds generically named “elephand birds”. 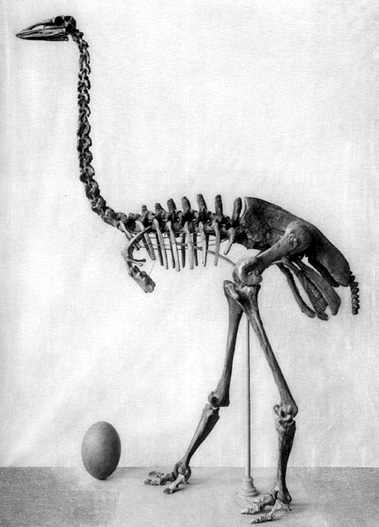 These were huge animals with an important mass, and with an overall aspect reminding that of the ostrich (Strutio) from Africa or the moa (Dinornis) from New Zealand. 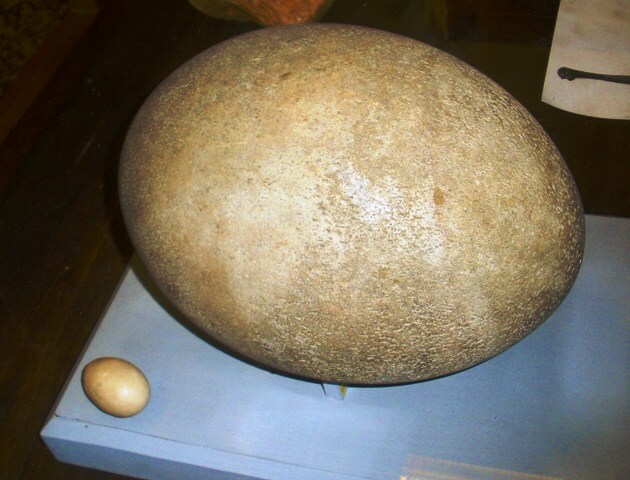 They were also known to lay enormous eggs, which are still found in some remote areas of S. Madagascar, mostly in numberless fragments, or, sometimes, as entire shells. In general these animals were attributed to two distinct genera, Aepyornis and Mullerornis. Apaprently these animals survived until the 17th Century, with Marco Polo mentioning them as the “rock birds” in his Milione. Well, the human colonisation was said to start around 2000-2500 years ago, but recent findings support for a much older reference. The team of Hansford and colleagues discovered that subfossils eggs of Aepyornis have signs of slaughtering referring to about 10,500 years ago. And this is already a novelty for the human colonization history of Madagascar. If Homo sapiens was already on the island at that time, it logically means that the period of convivence between our species and these animals (and many others as well) was much longer. For this, it is possible that the reason/cause of their extinction was not (only) Homo presence, but, maybe, something else. 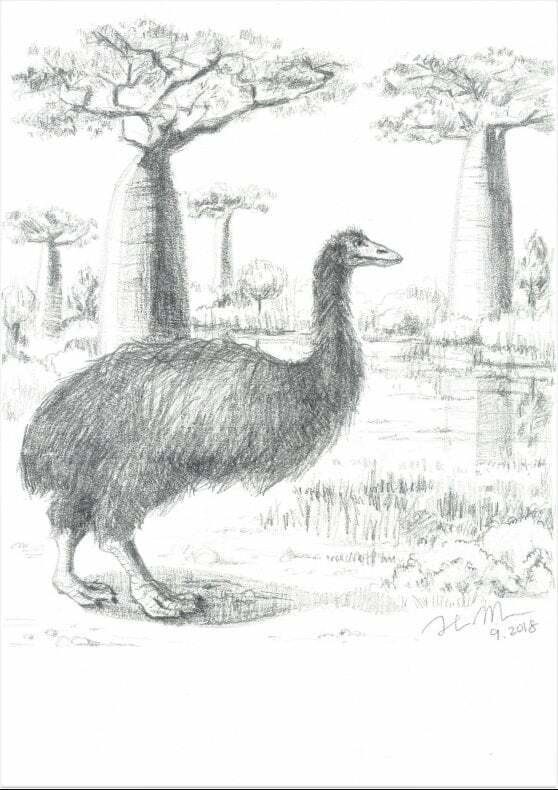 Beside this, the chronicle of giant birds in Madagascar got the new description of a third important genus, whose name has been baptised as Vorombe. Vorona in Malagasy means “bird” and “be” means “big”. So, Vorombe was a really big bird. Apparently it was the giant in terms of weight of all the birds even lived on Planet Earth: its mass was up to 680 Kg! 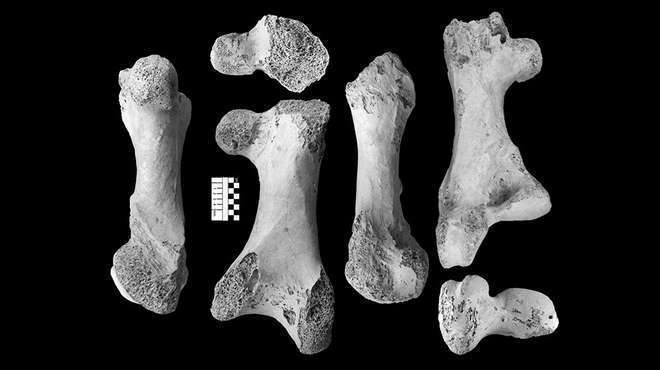 So far, in their work Hansford and Turvey attributed bone remnants to this new species and reported information on the species distribution in Madagascar, and showed that Aepyornis maximus, A. hildebrandti, Mullerornis modestus and Vorombe titan (the currently accepted species of elephant-birds had different diffusions and had probably different ecologies. It is a shame that these animals went extinct, and wonder which was the species reported in the past by Philibert Commerson in his “Voyage de Madagascar”. Possibly the animals were on the brink of extinction in the 17th Century, and still remains to understand if humans were the only cause of their disappearence. Hansford J.P. & Samuel T. Turvey, 2018. Unexpected diversity within the extinct elephant birds (Aves: Aepyornithidae) and a new identity for the world’s largest bird, Royal Society Open Science, 2018, DOI:10.109. Madagascar is well-known for its endemec and peculiar amphibian fauna: more than 350 species living only there and at least other 200 which are waiting for a formal description. But habitats are going away under the deleterious actions of Homo sapiens, who is affecting the last fragments of dry and rainforests. Among the negative anthropogenic actions we may also quote the introduction of alien species. One of the last cases deals with the so-called Asian common toad, Duttaphrynus melanostictus, of which I already narrated some time ago (https://francoandreone.wordpress.com/2018/02/26/the-asian-common-toad-in-madagascar-out-of-control/). Fulvio Licata is currently conducting his PhD to study the migration, expansion and effect of this species on natutive habitats and species. One of the first fallouts of this study is the recent publication of a paper on the renowned journal Biological Invasions. In this study Fulvio documented the expansion of the invasive range of this stoad pecies, calculating the invasion spread rate, and providing estimates of abundance and habitat preferences. The distribution range showed a fivefold increase of the invaded area over 3 years, and a doubling of the rate of spread. The species appears therefore to be a severe invasor and we are just waiting that it enters within forest reserves. We do not know yet which will be the effects on the amphibians and other animals living there. the risk is that potential predators (snakes, mammals, birds) could become killed when trying to ingest the toad, due to its toxicity. This was already showed in the parallel invasion occurred/ing in Australia by the cane toad Rhinella marina. The Asian toad has all the potentialities to threaten the already delicate fauna of Madagascar. Next years will be extremely crucial in defining the impact of this amphibian. 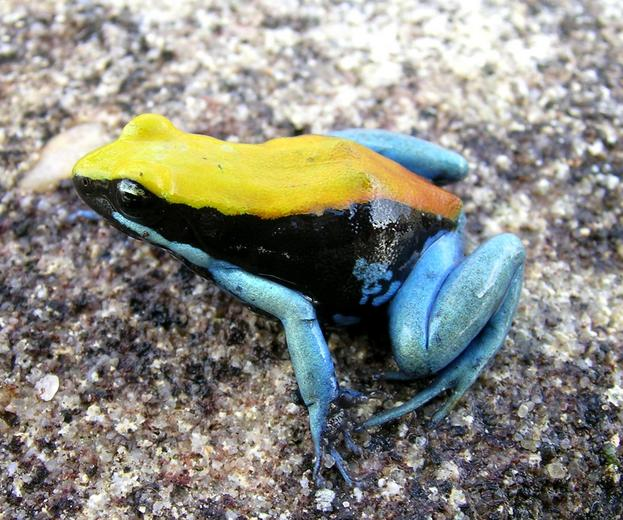 In December 2018 (scheduled dates: 4-6) I will be honoured to participate to an important workshop dedicated to the conservation of Mantella cowanii, one of the most threatened frogs of Madagascar, known as “harlequin mantella”. This small terrestrial frog is limited to the high plateau of Madagascar. This area is particularly known since it is almost totally deforested and subject to repeated fires. Mantella cowanii, which was once likely much more distributed, today is known to a few sites, which are also much isolated. The most known site is around the village of Antoetra, not far from Ambositra. The other sites where the species is known to occur (or at least from where it was recently signalled) are around Ambatolampy, on the Itremo Massif, and around Betafo (not far from Antsirabe). In the past the species was actively collected for the pet-trade, but since 2003 the species’ trade is under ban. During the meeting, that will be realised within the activities of the IUCN SSC Amphibian Specialist Group / Madagascar there will be the chance to relaunch the conservation actions needed for this species, especially in the context of the so-called “Sahonagasy Action Plan”, the project which aims to protected the extremely rich amphibian fauna of Madagascar, currently known with more than 320 described species and at least other 200 to be described in the forthcoming years. The Isalo Massif, in SW Madagascar, is one of the most interesting and far mysterious areas of Madagascar, despite of the fact that – at the same time – it is also one of the most visited sites. Its peculiar landscapes make it really interesting: around 80 km long, it is featured by a a rough physionomy, a quite dry climate and an intricate system of canyons which makes it really appealing. In the last fifteen years we spent quite a lot of time in investigating the herpetofauna living there. In fact, little was almost known about this massif in terms of biodiversity when, together with my team, began to visit the spectacular sandstone mountains there, in search for amphibians and reptiles. While the high temperature and the sub-desertic profile make quite easy to expect the presence of a rich reptile fauna, comparatively less was hypotesised for amphibians. In reality, the canyon system and the presence of water with permanent and temporary streams and rivers created in the last million years a really interesting site where many species differentiate. Recently we published our final results, obtained by collating former studies carried out wwithin and outside the National Park limits between 2004 and 2014. As a total we reported the presence of 24 amphibians and 47 reptiles. For most of them we provided the molecular data sets. So far we found four described endemic amphibian (Gephyromantis azzurrae, Mantella expectata, Mantidactylus noralottae, and Scaphiophryne gottlebei) and one reptile species (Trachylepis nancycoutuae). Of the taxa listed for Isalo, seven amphibians and six reptiles are new candidate species, and among them at least one amphibian (Mantidactylus sp. aff. multiplicatus Ca65 “Isalo”) and three reptiles (Lygodactylus sp. aff. tuberosus Ca02 “Isalo”, Paroedura sp. aff. bastardi Ca02 “Isalo” and P. sp. aff. bastardi Ca03 “Ilakaka”) are currently known only from Isalo. The importance of the study is – among others – to the collaboration among the authors and with Malagasy institutions, and in the use of an integrative approach, using morphology, colouration, ecology data and museum specimens. This stresses once more how the natural history museums and the collections there preserved are crucial tools to unveil biodiversity traits and define conservation actions. Cocca W, Rosa GM, Andreone F, Aprea G, Eusebio Bergò P, Mattioli F, Mercurio V, Randrianirina JE, Rosado D, Vences M, Crottini A (2018). The herpetofauna (Amphibia, Crocodylia, Squamata, Testudines) of the Isalo Massif, Southwest Madagascar: combining morphological, molecular and museum data. Salamandra, 54 (3): 178-20. Meravigliose e preoccupanti notizie allo stesso tempo dal Pianeta Terra. La salamandra gigante cinese era (una volta) classificata e considerata un’unica specie, sotto il nome scientifico di Andrias davidianus. In un articolo apparso su Current Biology i ricercatori mostrano invece che le popolazioni attualmente esistenti (e in preoccupante pericolo di estinzione) sono in realtà un assemblaggio di specie, cinque o forse addirittura otto! Questo fatto indica una volta di piu’ che la tassonomia degli anfibi e di molti altri animali del nostro mondo biodiverso è ancora in uno stato incompleto e che l’attività’ degli zoologi e tassonomi (anche loro in via di estinzione) e’ ancora estremamente necessaria. Non solo per conoscere le specie che vivono intorno a noi, ma anche – si spera – per proteggerle. Tutte le cinque (o otto) specie cinesi appartenenti al genere Andrias sono minacciate. Non solo per l’alterazione degli habitat e per altre problematiche classiche, ma anche perché le diverse popolazioni, ora riconosciute come specie distinte, sono state traslocate più volte: ritenendo che gli individui appartenessero ad un’unica specie salamandre provenienti da diverse località sono state rilasciate in habitat non propri, con conseguente incremento di fenomeni di ibridazione. Questa suddivisione in 5-8 specie è stata vista come sorprendente, e fino ad ora non riconosciuta a causa del fatto che le salamandre presentano una morfologia simile, mentre in realtà si sarebbero differenziate nel tempo nei tre sistemi fluviali principali e in alcuni altri bacini idrografici, fra loro isolati. Questo isolamento ha probabilmente causato una profonda divergenza ecologica e geografica nonché una conseguente speciazione. ​Wonderful and worrying news at the same time. 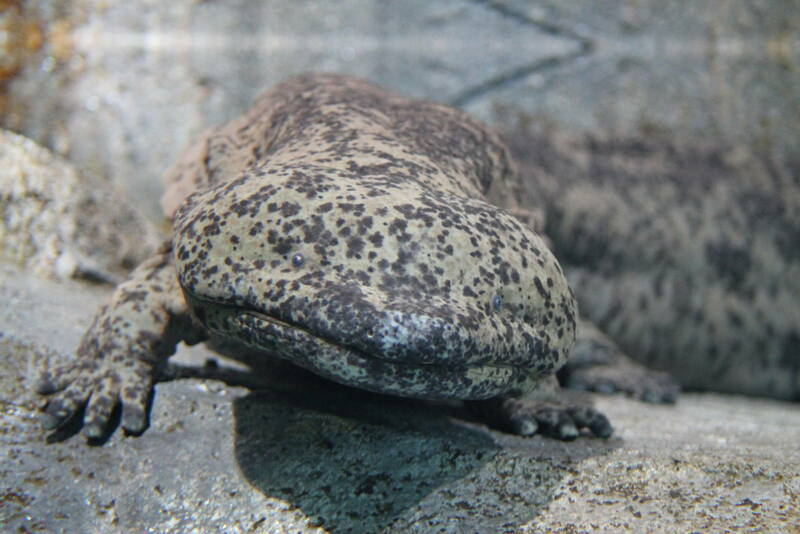 The Chinese giant salamanderwas (once) classified and considered just one species, under the scientific name of Andrias davidianus​. In a paper appeared just today on Current Biology shows that in reality this is an assemblage of species, five, or possibly, eight! This just indicates that the taxonomy of amphibians and many other animals in the world is still in a preliminary state and studies are extremely necessary. Not only to know the species living around us, but also, and hopefully, to protect them. All the recognised five species belonging to the genus Andrias from China are threatened and under risk of extinction. Not only for habitat alteration and food collecting, but also because the several populations, now recognised as putative species, have been translocated several times and put in conditions to accelerate hybridisation phenomena. 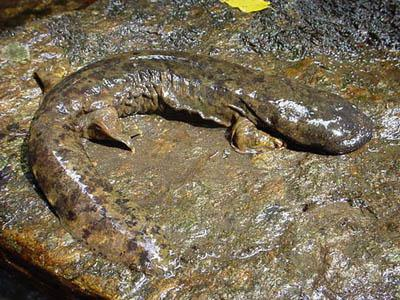 This splitting in 5-8 species has been seen as surprising, and until now unrecognised due to the fact that the salamanders present similar morphology, while in reality they differentiated over the time in at least three major river systems, each splitting in several others. These basins likely caused a deep ecological and geographical divergence and genetical isolation, which led to speciation.